Who can use the Slack Integration? Any organization with a paid plan has access to the Transifex-Slack Integration. This integration allows Slack users to receive notifications and get informed on translator's issues. All Slack users can also monitor progress based on statistical reports generated within the Slack collaboration tool. Teams using Slack as a central communication tool in their workflow can now monitor and manage their projects using their preferred Slack communication channel. Who can install the Slack Integration? Only Organization Administrators can install Slack Integration in Transifex. Step 1: Manage your Organization's integrations. Then select Manage Integrations from the Left Hand Side Menu that appears. Step 2: Install the integration on your Organization. where the installation will continue. Select the Slack Workspace that will be linked to your organization from the drop down list located on the top right hand side. 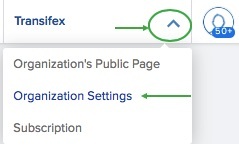 From the Post To drop down list select the Channel you want to receive Transifex notifications. Then click the Authorize button to continue. 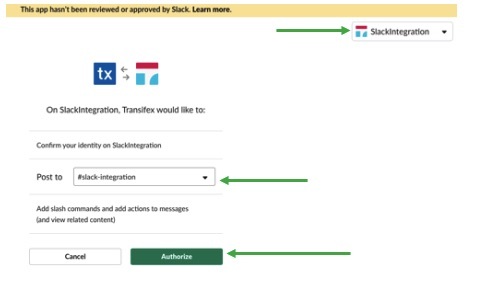 Step 3: Install the Transifex App in your Slack Workspace. Follow the instructions as described in the Slack documentation indicated here. All notifications are bound to a specific Slack channel, so they are channel-bound, not user-bound. A new resource has been added to a project. Clicking on each link in the message will open the resource, user profile, project, or translation editor respectively. A new issue was created by a user about a string in the editor. Clicking on each link in the message will open the user profile, or the issue in the translation editor respectively. For more information on creating and handling issues consult our documentation guide here. An issue was resolved in the editor. For more information on resolving issues consult our documentation guide here. A project announcement was created. Clicking on each link in the message will open the user profile, the announcement or the project respectively. For more information on announcements consult our documentation guide here. A resource language was 100% translated. Clicking on each link in the message will open the project and resource respectively. Slash commands are available to all Slack workspace users that Transifex app was installed to. Clicking on each link in the output will open the associated project. Get a project's localization progress. Clicking on the language link in the output will open the associated language in the project. Get the localization progress of a specific project's language. <language> can be either the language locale or the language name. Get the translation progress of a specific project resource. Can’t find what you are looking for? Speak to our team!